Bull or Bear: To Which Do You Conform? Home Culture Bull or Bear: To Which Do You Conform? This past week a client of mine sent me an email which was instantly humorous, but prompted me to ponder its message further. Good humor is characterized by underlying kernels of truth. So it was with this message. After the initial amusement, the kernels of veracity kept popping up and I realized that it warranted additional examination as it typified, to an extent, the different perspectives maintained by those who identify themselves as either liberal or conservative. If a bull doesn’t like guns, he doesn’t buy one. If a bear doesn’t like guns, he feels that no one should have one. If a bull is a vegetarian, he doesn’t eat meat. If a bear is, he thinks no one else should eat meat either. If a bull sees a foreign threat, he thinks about how to defeat his enemy. A bear, however, wonders how to avoid confrontation and look good doing it. If a minority is a bull, he sees himself as independently successful. Their bear counterparts see themselves as victims in need of government protection. If a bull is down-and-out, he thinks about how to better his situation. A similarly down-and-out bear expects the government to take care of him and his working neighbors to pay for it. If bull doesn’t like a talk show host, he switches channels. Bears, however, demand that those they don’t like be shut down. If a bull is a non-believer, he doesn’t go to church. A bear who is a non-believer wants any mention of God or religion silenced and all public images thereof banished. If a bull believes in man-made global warming, he tries to reduce his carbon footprint. 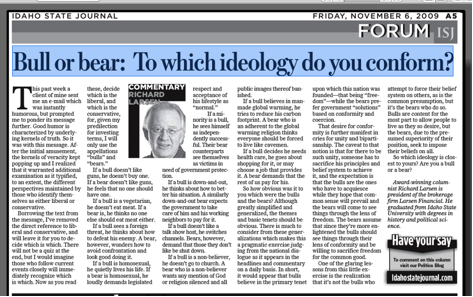 A bear who is an adherent to the global warming religion thinks everyone should be forced to live like cavemen. If a bull decides he needs health care, he goes about shopping for it, or may choose a job that provides it. A bear demands that the rest of us pay for his. So how obvious was it to you which were the bulls and the bears? Although greatly simplified and generalized, the themes and basic tenets should be obvious. There is much to consider from these generalizations which makes this a pragmatic exercise judging from the national dialogue as it appears in the headlines and commentary on a daily basis. In short, it would appear that bulls believe in the primary tenet upon which this nation was founded: freedom, while the bears prefer government “solutions,” based on conformity and coercion. That desire for conformity is further manifest in cries for unity and bipartisanship. The caveat to that notion is that for there to be such unity, someone has to sacrifice his principles and belief system to achieve it, and the expectation is that the bulls are the ones who have to acquiesce, while they hope that common sense will prevail and the bears will come to see things through the lens of freedom. The bears assume that since they’re more enlightened the bulls should see things through their lens of conformity and be willing to sacrifice freedom for the common good. One of the glaring lessons from this little exercise is the realization that it’s not the bulls who attempt to force their belief system on others, as is the common presumption, but it’s the bears who do so. Bulls are content for the most part to allow people to live as they so desire, but the bears, due to the presumed superiority of their position, seek to impose their beliefs on all. So which ideology is closest to yours? Are you a bull or a bear?